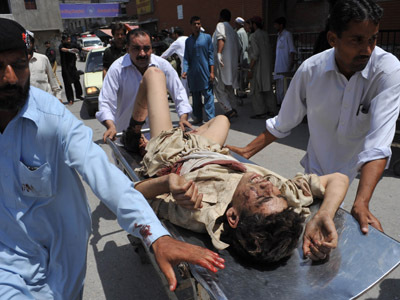 ­A series of three deadly bomb attacks in Pakistan killed at least 29 people, with dozens more wounded. Two of the attacks targeted mourners gathered for Shia Muharram rituals at mosques in Karachi and Rawalpindi. The latest attack occurred in Rawalpindi, when a suicide bomber detonated explosives strapped to his body at a procession near the Qasr-e-Shabbir Mosque, killing at least 22 people and injuring more than 40, including several children. 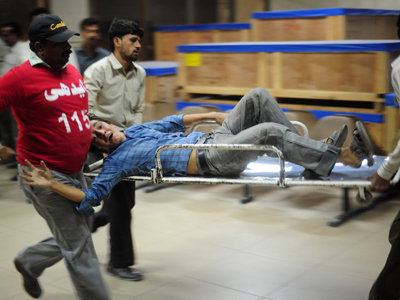 The assault came shortly after twin bomb blasts killed at least two people and wounded 30 outside Karachi. Journalists, policemen and rangers were among the victims. 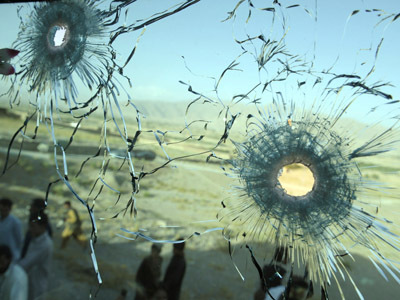 In a separate terror attack, a roadside bomb in Quetta targeted a security vehicle escorting schoolchildren. Five people died in the attack, including three soldiers, and more than 30 others were wounded. “The suicide bomber blew himself up when security officials were checking [his body]. We had prior information about the attacks and were fully alert,” a rescue service spokesman told AFP about the attacks in Rawalpindi. Witnesses say that “two unknown people, who did not appear to be mourners, barged in on the procession and one of them blew himself up”, Pakistani television network Geo TV has quoted. The blast blew a hole in one of the walls of Imambargah, a congregation hall for Shia commemoration ceremonies. Body parts were disseminated around the scene. Up to four thousand mourners kept on marching after the incident, despite knowing of other explosive devices found at the site. Seven failed hand grenades were also recovered near the scene. The injured have been taken to hospital, with medics fearing a rise in casualties. There was no immediate claim of responsibility for the attack, but the attacks are believed to have been carried out by Sunni extremist groups linked to al-Qaeda, who have increased their attacks in recent months. The bombings happened despite strict security measures for the holy month of Muharram, which marks the anniversary of the death of Imam Hussein, a grandson of the Islam's Prophet Mohammad. It was also a day ahead of a developing nations (D8) summit. Interior Minister Rehman Malik told the media that the attacks were designed to show the government’s inability to provide appropriate security for this high-end meeting. Thousands of law enforcement agents are expected to be deployed this weekend as about 50,000 people are expected to march in Islamabad on Saturday, with thousands more expected in Karachi.